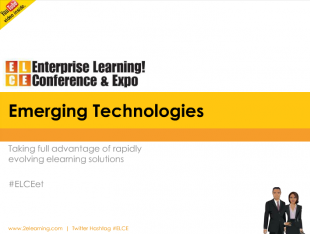 This week, OpenSesame’s Josh Blank and ej4’s Dan Cooper gave a presentation at the Enterprise Learning Conference and Expo on the applications of exciting new technologies for learning: video, games, mobile, and social. Of course, these are buzzwords you hear every day. The objective of Josh and Dan’s presentation was to provide listeners with concrete examples of how these technologies are being applied in the workplace – and to share some tips on getting started. For the full presentation, check out the slides. But we’ll give you a taste – and some resources for further learning. The current model of education and professional training is one-directional. An instructor or leader lectures or broadcasts information, and the learner memorizes the information to regurgitate it for an assessment. But, in real life, our supervisors and managers don’t test our learning with a multiple choice quiz. They test us by evaluating how well we accomplish complex tasks. So how do emerging technologies change this model? They create opportunities to connect learners to engaging information, opportunities to practice new skills and to each other – to deepen their learning and understanding, throughout their workday. Remember that video can effectively be used not only by creating it yourself but by curating and sharing video resources that exist throughout the web. Out of hundreds of millions of videos on YouTube, there’s probably something that will help you tell your story – even if it’s just something showing what not to do. As you know if you’ve played digital games like Words with Friends or Angry Birds, they’re addictive. Games are engaging because they create positive emotions and allow you to accomplish goals while taking risks. Games make you feel good, and you bring the emotions and new skills from games into your real life. In the context of workplace learning, games represent opportunities to engage people in practicing and applying new skills – perfect for them to try new things before tackling challenges in real life and for a refresher on skills they’ve studied in the past. Games make learners active participants in the content, taking the lead in applying new information to different situations. For fantastic examples of learning games, check out Tandem Learning’s “The Change Game” or Compliance Cartoon’s “AntiTrust: The Board Game”. Mobile learning is information made accessible to employees through mobile devices – either through native applications, web-based content or information saved on the device itself. The benefit of mobile learning technology is the opportunity to put information in the learner’s pocket – literally. The key with making mobile learning is that it’s gotta be short, easily found, user-friendly and fast. Start with the end in mind and keep the interface simple. If you have to tell them how to use it, it’s too hard. It’s a small screen – develop backwards. For a great example of mobile learning, check out the Skill-Pill mobile MBA. Social learning is knowledge or skills acquired through interactions and communication between people. Social learning occurs all the time, with or without social media – but the use of social media tools can accelerate and enable social learning in organizational environments. We’ve done a series of blog posts on the use of social media tools for accelerating social learning in the workplace. Read them and view our “Beginning Twitter for Professionals” course for tips on getting started. New technologies enable educators to change the way organizations promote learning – from a one directional lecture to a connected, content-rich learning environment. We’re thrilled to be part of unlocking learning with new technology. For more details, examples, and suggested applications, view the slides.